Oh man, I’m loving this new area we’ve entered! Goodbye desert! No more drinking warm yucky water that won’t quench my thirst. No more stocking up and carrying of my maximum capacity of water just in case the next source is dry. Goodbye caked on layer of dirt that I have no water to wash off. Hello to fresh air, shaded tree lined trail, amazing views, and running water! I know snow will become part of it too, but I’ll take it! 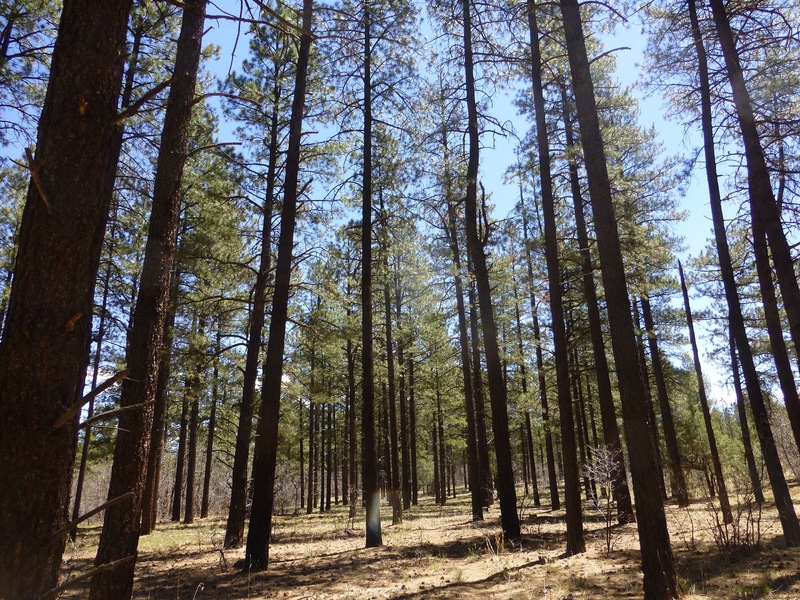 I can’t even explain how amazing it feels to breathe in crisp fresh cool air, walk on soft pine needles, and hear birds, a running stream, and the wind blowing through the trees. This is my happy place! We slept in a bit and got going at 7am because of how cold it was. 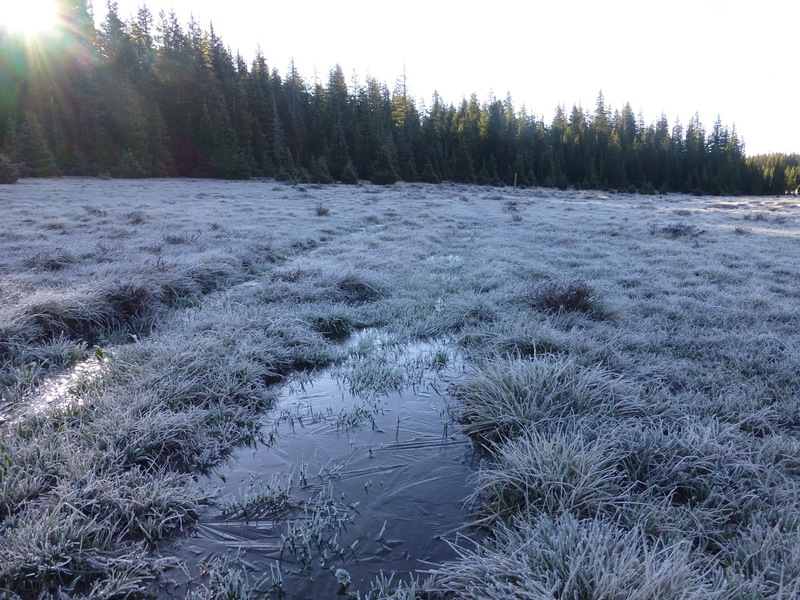 It was below freezing when we started and the first hour and a half went in and out if marshy areas. The trail and the ground surrounding it was fully saturated with a thin layer of ice on top. There was not way to dodge it. Not the best way to start a cold morning because we were all wearing mesh trail runners so we all got cold, soggy, wet feet. The good news is that they dried quickly during our morning break at a water source. 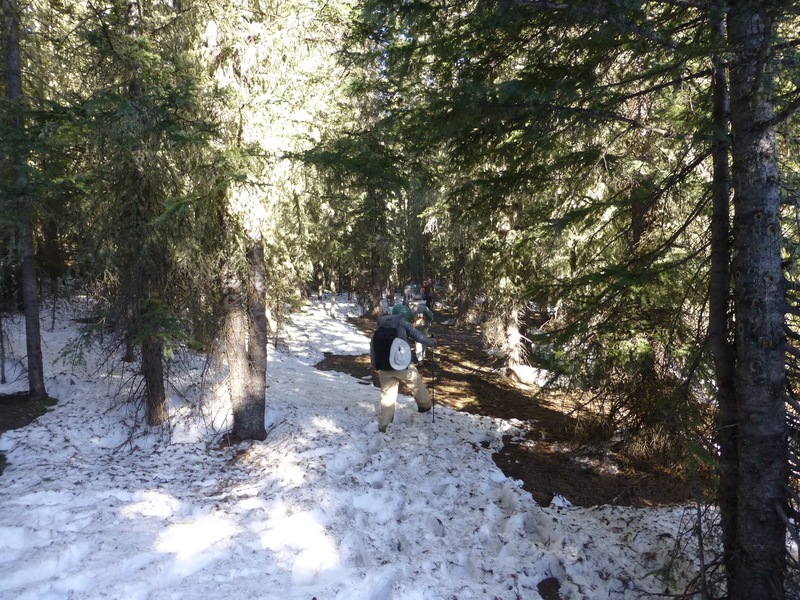 Since we were at a high elevation, we also went through more patches of snow in the trees, but nothing major at all. We spent the morning descending down almost 3,000ft through some great wooded sections. I was in my happy place and the miles came easily. 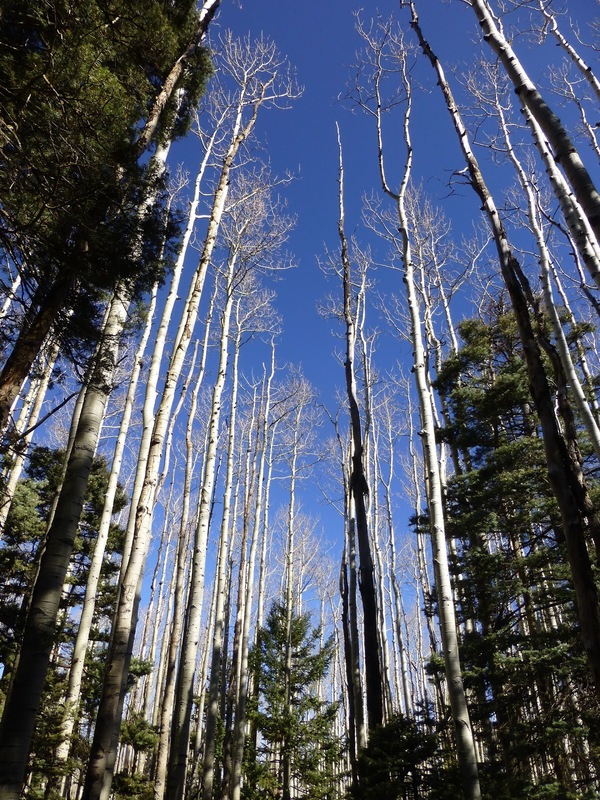 One cool thing was that we saw more really tall aspens. 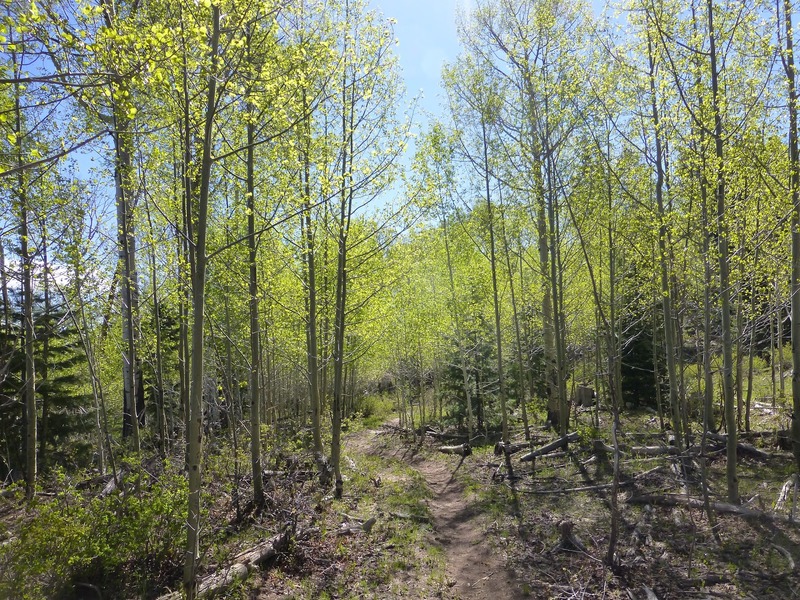 Then, we turned a bend and all of a sudden all the aspens had beautiful green leaves that shimmered through the sunlight. Just loved it! We took a relaxed lunch and I was getting antsy, but I know there is no rush. The group says they’ll break me and get me to relax more. It would probably be a good thing and I’m working on it. I always said that the one thing I wish I had on the PCT was to sleep and hour later and finish an hour earlier…and that’s what we did today while still getting in two good breaks and 24mi. It’s definitely growing on me and I don’t feel a need to push big miles. I’m learning to relax a bit. The days will be more tiring soon with the snow, more difficult terrain, and higher elevation. It’s good not to push unnecessarily. 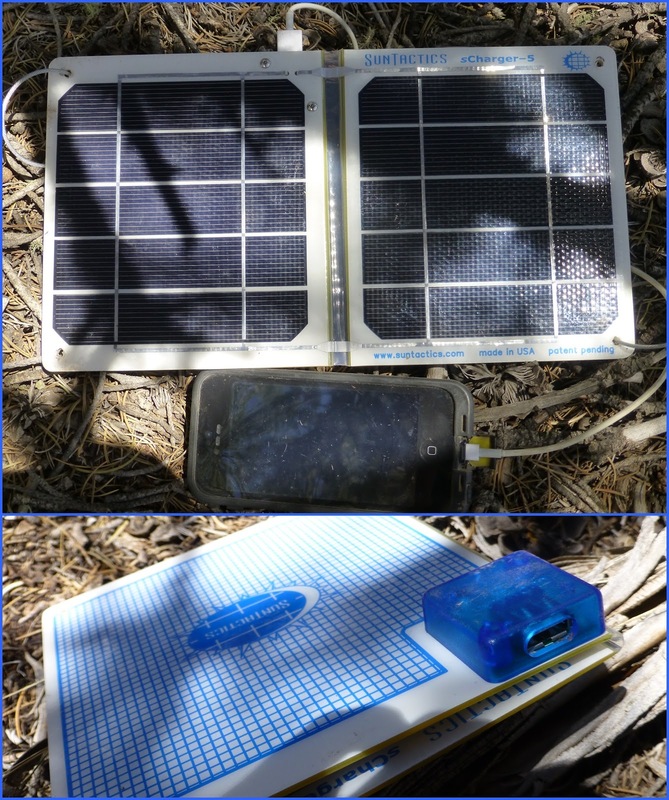 I am super stoked because I got a powerful new solar charger. It’s called the Suntastics S-Charger5. My friend Rockin’ was testing it out and recommended it. I think it is only 1oz heavier than the PowerMonkey I’ve been using which would put it around 7-8oz. I’ll find out exactly and get it on my gear list soon. Here is what it looks like. I know it seems big, but it fits perfectly on the top of my pack and isn’t as big as it looks. Just during our 40min morning break I got an additional 35% charge for my iPhone. I may not even carry it on top of my pack because it will easily charge the iPhone over lunch each day. Rockin’ drilled holes in the corners and sent me clips to attach it, but it sits securely on top of my pack with the shock cord my pack came with. Only catch is that it doesn’t have an external battery pack to charge if you think you’d need one. I could hook my PowerMonkey external battery up to it, but it’s so quick and powerful directly plugging in the product, that I don’t think I’ll need it. I know this trail is plenty exposed and all I need is a pocket of sunlight every couple of days if I were stretching it out. I wish I had it for all that road walking this past month! Knowing have plenty of charge, I was also able to listen to my current audiobook called Wildwood by Colin Meloy. It is a bit of a fantasy that takes place in some kind of enchanted or magical forest. Just perfect for right now. By the way, I recently was given another audiobook on my care package list from a reader. Someone named Caty got me the Red Book, which I’m looking forward to. Caty, can you email me so I can thank you personally as the online gift did not give me any more contact information. Back to the hiking. 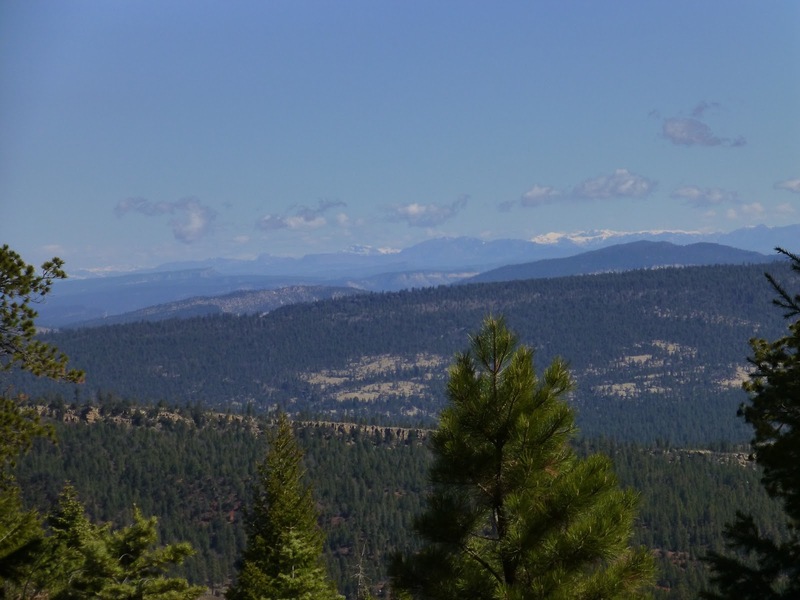 As we topped out today, we got our first distant view of what is probably part of the snow capped San Juans where we are headed. Exciting! After lunch, we had the big climb of the day that took us up over 1,000ft to get over the Mesa Del Camino. A massive and beautifully colored Mesa we had seen all day. Here it is as we approached it. And here is one I hope shows the colors. They were so bright and varied! We ended the day with a steep decent into a canyon of over 1,000ft and some great scenery that I couldn’t capture on camera. Sweetfish showed up as we were all eating dinner so we are all together again. The temperature is much warmer and I am going to sleep great! 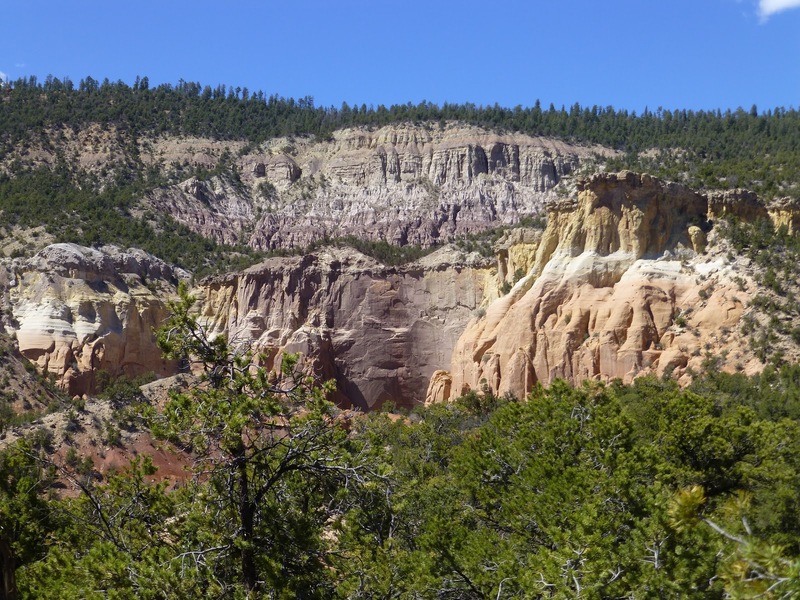 Tomorrow is 15mi to Ghost Ranch. Another one of the most talked about spots on the trail where I may be taking a zero with the rest of the group. I may catch Balls and Sunshine there before they leave too. 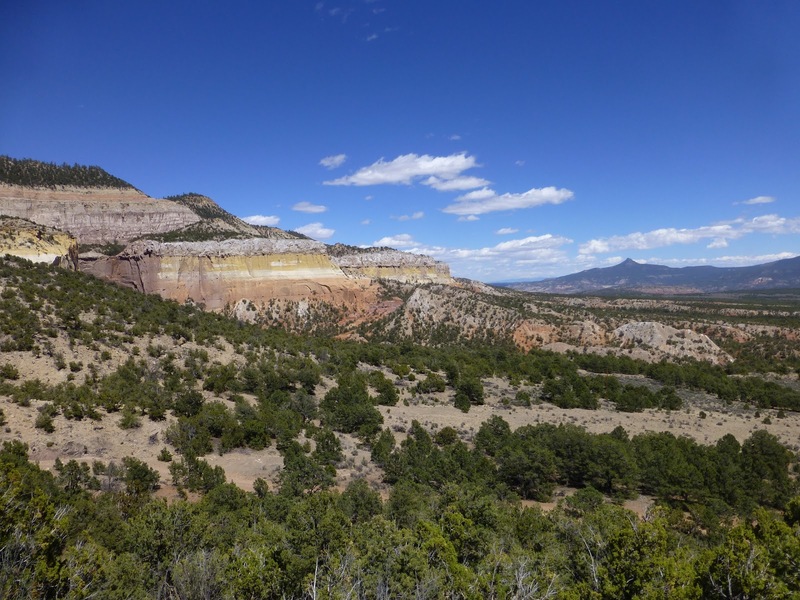 I’ll explain more about Ghost Ranch tomorrow.